As we reach the tail-end of the year, one of the most devastating events was how gunman James Holmes opened fire in a crowded movie theater showing the Batman film, The Dark Knight Rises, killing 12 people, including a six-year-old girl. Fifty-nine others were wounded or injured by tear gas the gunman set off before opening fire. I’m no stranger to this kind of dehumanised violence. As a hostage negotiator, I’ve been held hostage myself four times in the line of duty. That’s never a comfortable place to be, but I kept in mind that the success rate of hostage negotiators is as high as 95% and I knew why. Hostage negotiators are successful because they build trust through dialogue. That dialogue changes the mindset of the hostage taker so he will surrender his weapons and hostages, even though he is aware he will probably go to prison. In essence, the hostage negotiator becomes a “secure base” to the hostage taker. A secure base provides a sense of safety and stretch, just as a parent, grandparent, or caretaker provides their child, both protection and encouragement to go out, explore and take risks. Today, I work mostly with corporate leaders instead of hostage takers. In my book Care to Dare, I define a secure base as “someone or something that gives protection or a sense of protection, inspires or brings forth energy within an individual.” With this inspiration and energy, individuals step out of their comfort zones and strive to fulfill their untapped potential. I believe this quality is the single most important criterion for delivering sustainable high-performance leadership. Many hostage takers have few secure bases in their lives. Hostage taking is always preceded by a loss or a series of losses. The most dangerous hostage taker is the person who has no attachments and refuses to talk. However, when a hostage negotiator offers hopes, options, and positive solutions by gaining the trust of the hostage taker, he or she can become a secure base. To become a secure base to my hostage takers meant caring about them as people and gaining their trust to explore positive solutions, both for them and their hostages. Once I understood the motivation behind the hostage taking, I could begin the search for options. By tactfully leading the way and while acting as a “secure base,” I was able to disarm my four hostage takers without force. Each time, I survived precisely because I cared for the person who had a weapon trained on me. That process involved creating a relationship – an emotional bond – with the hostage taker. Neuro science explains why this bonding works. The human brain has one goal: to survive. That’s why humans are always searching for the negative and instinctively act defensively. However, when a secure base creates a bond, the resulting sense of protection lets the brain shut down its defensive focus. Then the brain can look for positives and opportunities. Holmes, the accused shooter in the Aurora mass murder, is a typical example of a “loner” who has no secure bases or recently lost them. His university position as student, his identity, his apartment, his girlfriend, his father, to name just a few. As someone with extensive experience with severely troubled people, I see his lack of secure bases as a key contributing factor to his alleged crimes. These days, I am a professor of leadership and organisational behaviour, yet I still focus on the most basic human needs that drive behaviour. If leaders are not secure bases to their employees, employees cannot trust them and they will be defensive and even feel like hostages. Gallup studies show extremely low rates of employee engagement: 7% in France, 12% in Germany, 17% in the UK, and 28% in the United States. The major finding was that high engagement was connected to high emotional care from the immediate boss – a boss who became a secure base. 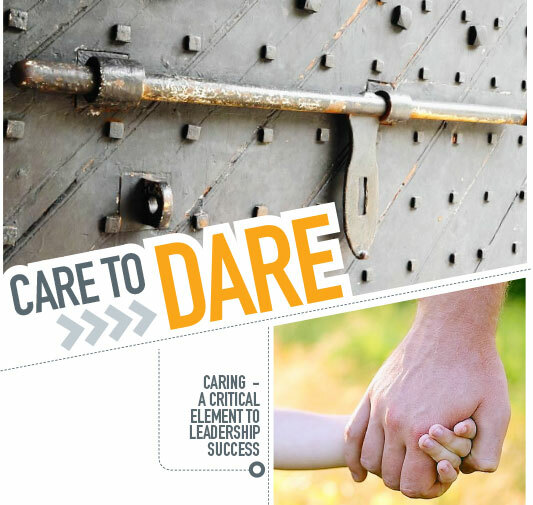 When caring was present, the employees would “dare” to take risks and stretch themselves to achieve great things. This winning combination of caring and daring not only shuts down defenses, it can also unleash extraordinary potential. As we approach the end of this year, I urge each of you to review your caring and daring. Do you care for your employees, your children and others you lead? You need to care. If you care, do you then dare those you lead to take risk and stretch themselves. This coming year, make it a point to “care to dare”. George Kohlrieser is head of leadership at IMD in Switzerland. His best selling new book Care to Dare is now available in all major bookstores in Malaysia. He spends time in Malaysia teaching and helping senior leaders to learn how to truly care and dare. If your organisation would like George to help grow leaders, email people@leaderonomics.com.